One of The Legal Genealogist‘s pet peeves is when someone takes something another genealogist has done, strips off the identifying information and reposts it as if it was the second person’s work. That, by definition, is plagiarism, and it’s a great big ethical no-no in genealogy. Most of the time, people who do this are doing it without malicious intent. They don’t realize that they’re actually stealing someone else’s work and depriving the other person of credit for the work; most of the time they think they’re just sharing. But there have been cases — famous ones sometimes — of genealogists who have set out to defraud: to pass off totally fictitious results as if they’re the real thing. 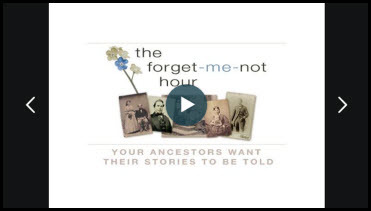 And, this week, I had a chance to discuss these issues with Jane E. Wilcox and Robert Charles Anderson, Director of the Great Migration Studies, in an hour-long recorded session in Jane’s wonderful The Forget-Me-Not Hour: Your Ancestors Want Their Stories to Be Told radio show on WHVW 950 AM radio in Poughkeepsie, New York, and on the internet at BlogTalkRadio.com/JaneEWilcox. Jane is a New York-based professional genealogist and, this week, her program focused on the problems we face in genealogy with plagiarism — passing off other people’s work as our own — and with actual fraud — fabricated results that sometimes are hard to detect. The interview is available online on BlogTalkRadio.com. • What is fabrication in genealogical research? • How do we avoid this in our own work? • What clues suggest fraud or fabrication? • What guidance is out there to learn about these problems? So if you want to learn more about some of the instances of fraud in genealogy, what plagiarism is and how to avoid it, come on over and find out more at The Forget-Me-Not-Hour: Plagiarism and Fabrication: Genealogical Land Mines. I love her and Bernice’s show’s. So much good work being done by Jane, Bernice and others! Any time I see an involved narrative with no sources I look for fraud or plagiarism. My family research groups encountered two fraudulent genealogies used for admission to lineage societies and another perpetrated by a genealogist for hire to steal money from an old lady. It took hundreds of hours of research time and hundreds of dollars in precious funds to debunk this garbage. These frauds are still all over the INTERNET and people are taken in by them. The waste of research time and money these things cause is the reason these frauds anger me a great deal. People and organizations take public domain material and stick a copyright notice on it. This claims the material is the original creation and intellectual property authored by the person named in the notice. In fact, it is a nasty form of plagiarism and copy-fraud. The person who wrote the public domain material is long dead and the U.S. government is not interested in prosecuting copy-fraud cases. One of my family files was placed on the web by some distant cousin who replaced my name with a new name in the sources and then stuck a copyright notice on it. It was outdated research but it stopped most of the research sharing in that family group. Sadly, there seems no way to stop this abuse unless we take web page owners and genealogy research groups to federal court. Just because something is unsourced doesn’t mean it’s a fraud. Sourcing is a relatively new addition to the genealogical toolkit, unfortunately, and a lot of good work was unsourced originally. One of my ancestors wrote an extraordinarily well-researched book/narrative lineage of the family around 1925. It is almost wholly unsourced, except that it often says things like “his will stated…” Which means that SOMEWHERE, there’s a will. I’ve been able to corroborate nearly every detail I’ve looked into. My point: one day I’m going to do my homework and then rewrite her book including the sources and re-publish it. Her incredible work deserves to be “completed” for future generations!